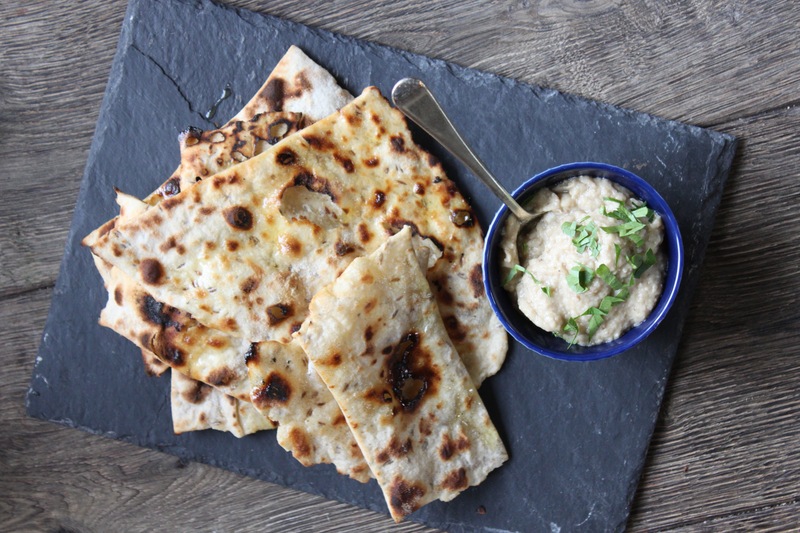 Babaganoush should be smokey- which makes it even better when it’s made using a wood fired oven! The blackening of the aubergine at the start of the recipe is probably the most important step- this is when we’ll be creating all our smokey flavours- so don’t be afraid to really blacken the aubergine up!! As a rolling flame is beginning to die down in your oven, pierce the aubergine several times all over with a fork, and using tongs, carefully pop the aubergine close to the wood embers and turn regularly until the skin is well blackened. After 10-15 minutes, remove from the oven, wrap in foil, and pop back in on the opposite side to the fire. Wrap the unpeeled garlic cloves in foil, and pop them next to the aubergine. Leave both parcels to roast for 15-20 minutes. Meanwhile, combine all the flatbread ingredients to form a dough, wrap in cling film, and pop in the fridge. When the time is up on the aubergine, carefully unwrap it, and peel and discard the skin. Put the flesh into a food processor and squeeze the garlic cloves out of their skin into the food processor. Add in the yoghurt, cumin and tahini, blitz for 5-10 seconds, season, and pop into a ramekin. Next roll out the flatbreads as thin as possible whilst getting your fire back up to a rolling flame. Flour each flatbread well, and cook directly on the oven floor- the flatbreads will begin to brown and bubble when they’re ready. 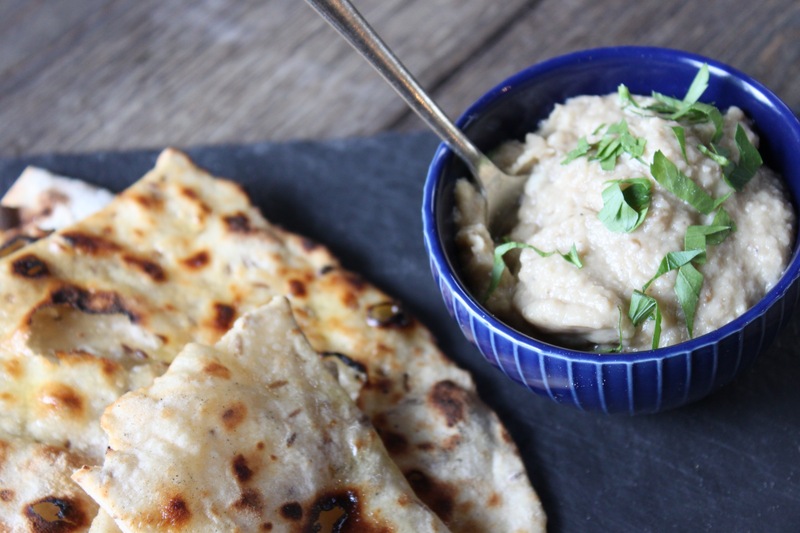 Finally, to serve, top the babaganoush with a good lug of olive oil and the chopped coriander.